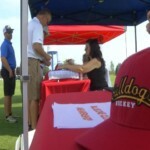 BIG RAPIDS – Alumni, family, fans and coaches of the Ferris State University Hockey program met at Katke Golf Course for the 32nd Annual Ferris State Hockey Alumni Golf Outing. Among the former players in attendance were stars from recent teams that made deep NCAA Tournament runs, as well as players dating back to the early seasons of Bulldog Hockey. Head Coach Bob Daniels said that the golfing is secondary to the opportunity for all of the alumni to re-connect with each other and swap stories. The Bulldogs begin their 2018-2019 campaign with a home exhibition game on October 6th. Ferris State Hockey Alumni Golf Outing.